Value: As a rough estimate of this coins value you can assume this coin in average condition will be valued at somewhere around $31, while one in certified mint state (MS+) condition could bring as much as $900 at auction. This price does not reference any standard coin grading scale. So when we say average, we mean in a similar condition to other coins issued in 1890, and mint state meaning it is certified MS+ by one of the top coin grading companies. [?]. 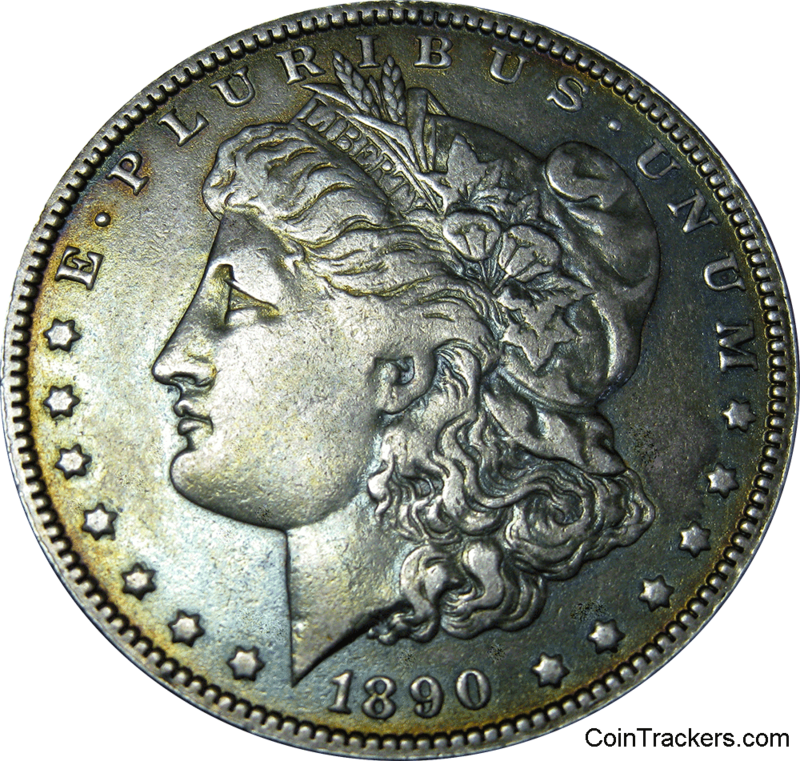 Additional Info: We bought an 1890 Morgan Silver dollar at a local antique shop for just over $30 We immediately fell in love with the toning on the coin. To see a larger picture of the Toned Morgan Silver Dollar Click Here. Current silver melt value* for a 1890 No mint mark is $11.6 and this price is based off the current silver spot price of $15.00 This value is dynamic so bookmark it and comeback for an up to the minute silver melt value. **When we say that 11,875,000, of these coins were produced or minted in 1890 this number doesn't always match the actual circulation count for this coin. The numbers come from the United States mint, and they don't reflect coins that have been melted, destroyed, or those that have never been released. Please keep that in mind.